Diamond Everley Roofing | ROOFING - • The Chamber - Lawrence, Kansas. 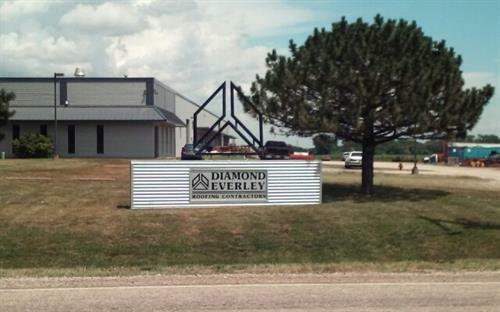 Diamond Everley Roofing Contractors has been providing trusted commercial roofing services in Lawrence, Topeka and surrounding areas since 1947. As expert roofing contractors our customers rely on us for accuracy, professionalism and attention to detail. Our experienced contractors will help you select just the right commercial roof for your business while providing timely repairs when you need them. We offer Single Ply Roofing, TPO Roof Systems, PVC Roof Systems, Rubber Roof Systems, Asphalt Roofing Systems, Built-Up Roof Systems, Modified Bitumen Roofing Systems, Metal Roofing and Standing Seam Metal Roof Systems. We also install strong and durable metal wall panels and metal roof panels. We will keep your roof in premium condition with our expert roof maintenance and roof leak repair services. Contact us for great rates at (785)843-3433 or 785-233-7910. We look forward to providing you with high-quality roofing services. Local Business - Locally owned and operated serving Northeast Kansas since 1947. Green Solutions - using innovative products that reduce negative impact on the environment. Experienced work - professional work force strives for the highest standards in quality. Exit 197 off the Kansas Turnpike to County Rd 1029 (Farmer's Turnpike) North to 1556 Lecompton Rd, Perry Kansas. OR 1 Mile South of 24 Highway in Perry, Kansas on Lecompton Rd to address.